As I declared in mid-July, summer isn't the right time to plant here but as I can focus on general garden maintenance for only so long I allow myself to fuss around a bit with succulents. This month, I extended that rule to encompass bromeliads as well. With August's Bloom Day now behind us, it seems the right time to highlight new foliage acquisitions in both categories. 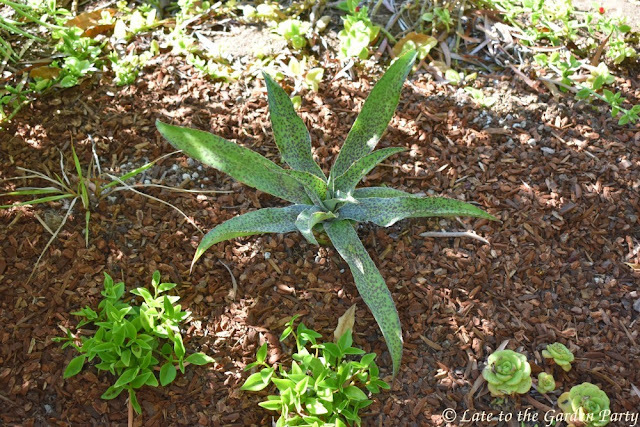 Pam Penick of Digging fame recently ended her monthly Foliage Follow-up posts but, after years of participating in these, I seem to be programmed to consider my foliage after Bloom Day. I've renovated a few succulent containers over the past month. 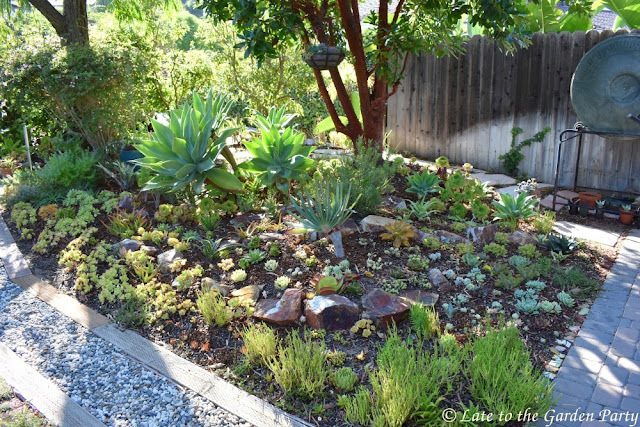 The most recent of these is a birdbath-style planter in the dry garden area on the northeast side of the house. 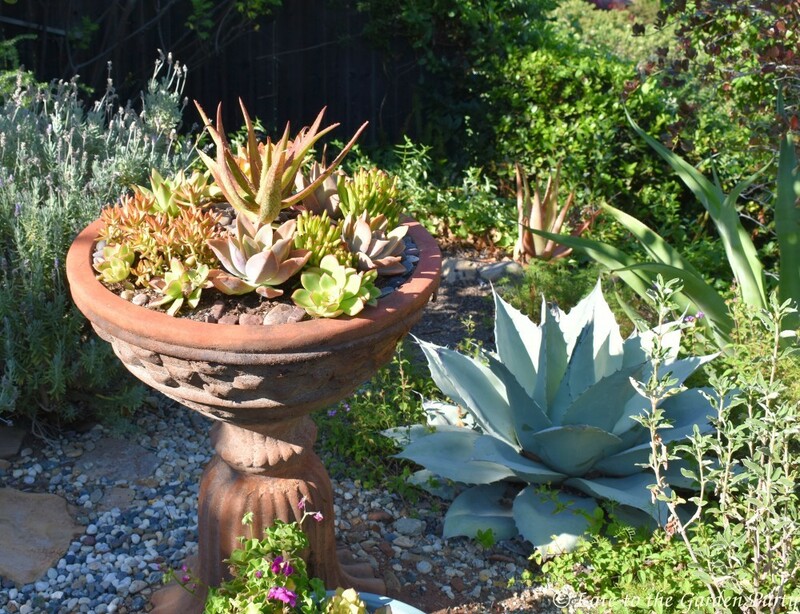 I first planted it with succulents in 2015, using Agave titanota 'White Ice' as the centerpiece. 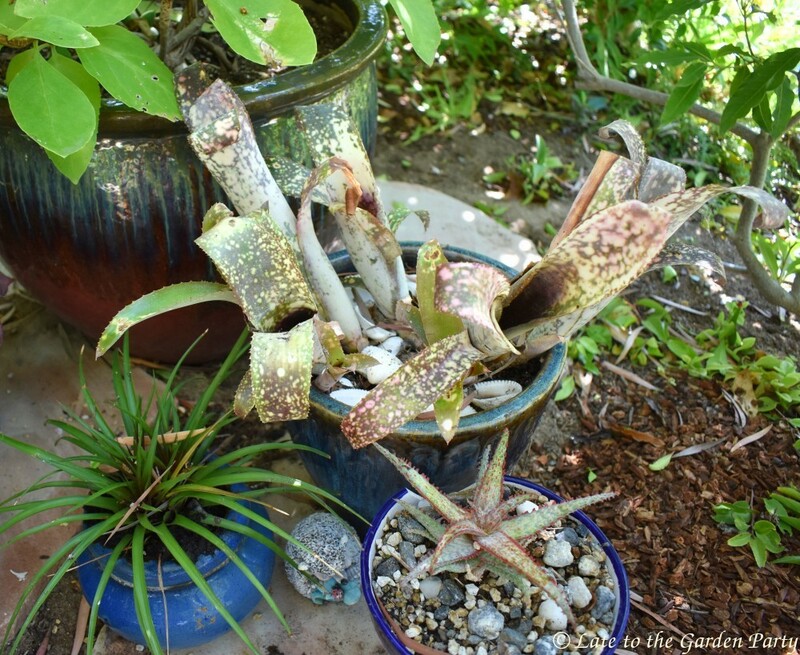 Over time, that plant turned a sickly shade of yellow and developed brown spots so it had to go. I saved 4 healthy pups, which I hope to use elsewhere in the garden or give away. Some of the agave's companions went back into the rehabbed planter. 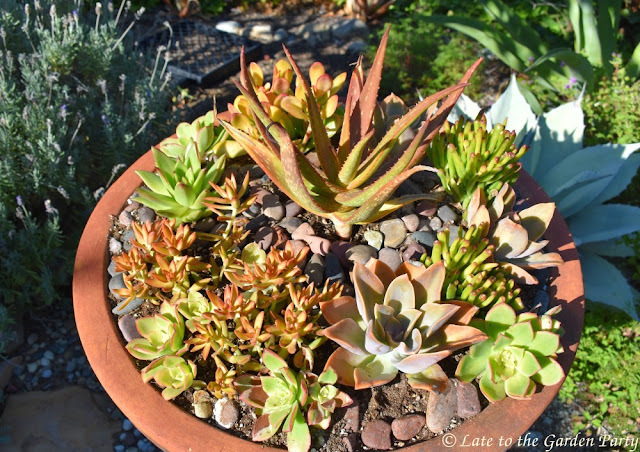 I added Crassula ovata 'Hobbit' and 'Sunset Jade', as well as an Echeveria agavoides and another noID succulent. I filled in with Graptoveria 'Fred Ives' and Aeonium 'Kiwi' from my own garden. Just as I finished I noticed that the container appears to be disintegrating. I'm hoping it'll hold up for another few years. I found homes for the mangaves I received by mail order last week too. Two of these went into the succulent bed in front of our garage. Can you pick out the new additions here? Probably not - that'd be like a game of "Where's Waldo?"! I've made do with a lot of small plants in this area but they've been slower to gain size that I'd have liked. The last of the new Mangaves went into the pocket garden behind the succulent bed. I developed that area last year with bromeliads in mind but x Mangave 'Spotty Dotty' doesn't look out of place. 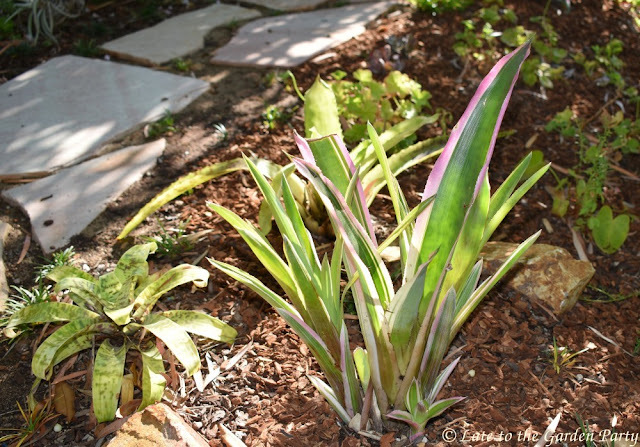 The bromeliads I planted in the ground in this area last September are doing fine, although they benefited from some cosmetic work. The pink edged plant is Aechmea 'Mend', which I bought at last year's bromeliad show in Torrance. Some leaves burned badly after it went into the ground but it cleaned up nicely and it's produced a few pups. 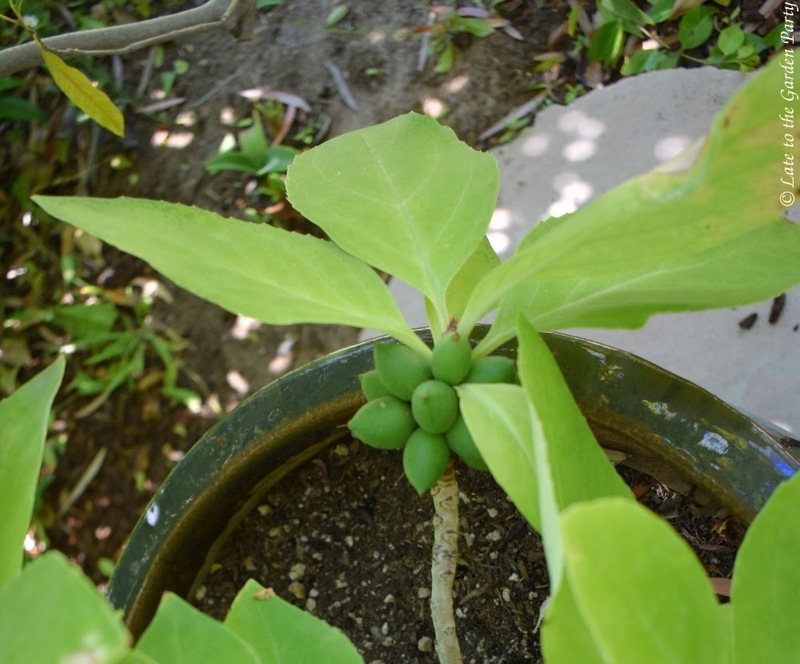 The Vriesia ospinae-gruberi on the left is a pup of a larger plant I have in a container. Ditto with the pup of Nidularium wittrockia leopardium behind the Aechmea. 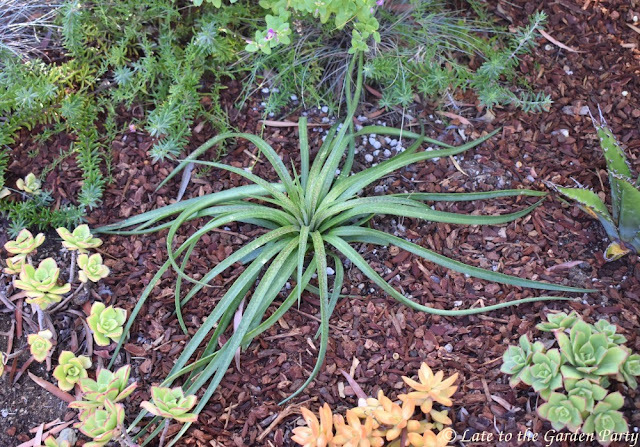 The bromeliad I plunked into a pot last year didn't fare quite as well as those in the ground so I may plant it out as well. This is Billbergia 'Carioca'. The central plant died out but it produced offsets. As I was checking on 'Carioca', I took the opportunity to check the plant in the larger pot behind it. Other than some burned leaves, probably the byproduct of early July's nuclear heatwave, it looks fine. Closer examination showed that it's developed fruit. The fruit have been likened to figs. Some sources say they're edible but apparently the USDA has them on the list of poisonous plants so I won't be sampling them. Maybe the raccoons will perform a taste-test for me. All things considered, Dermatobotrys saundersii was a very interesting purchase. I was alarmed when it lost all its leaves soon after I potted it up last November, only to be thrilled to find it flaunting flowers in December. And the flowers are followed by fruit! The plant's also epiphytic. You can read more about it here. 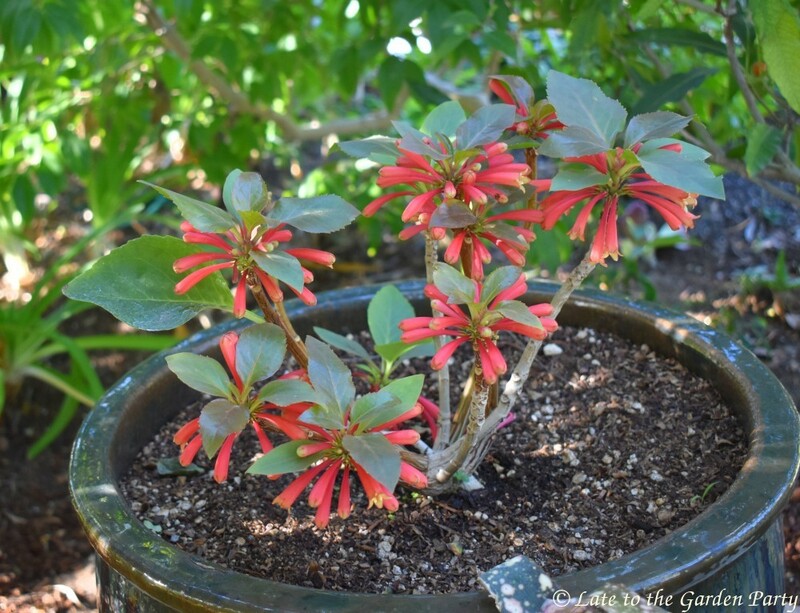 While I was looking for a spot for Mangave 'Kaleidoscope' I considered giving the boot to another plant, Kalanchoe prolifera. It looks like it belongs in a Dr. Seuss tale but I couldn't bring myself to pull it out. Also known as Blooming Boxes and Jack in the Beanstalk, I decided it could stay awhile longer. You can read more about it here. That's it for my review of my new - and some former - foliage purchases. Fall's just around the corner, or so I like to tell myself, and as temperatures decline, I'll be back to plant shopping on a larger scale. Lots of gorgeous foliage, old and new. While I love our climate (well, three seasons of the year) seeing magaves, bromeliads, etc. growing happily in the ground makes me a little jealous of yours. SoCal's climate offers some advantages, Peters, though summer isn't one of them.
! 'm always fascinated by the plants gardeners grow in very different locations from me. So many dramatic shapes and colors among your choices. I started writing a Foliage Follow-up post and then discovered it was unfinished and I was too busy yesterday to fix it and post it. But I always think of the 16th of the month as FF-up! It is hard to break that foliage follow-up habit, Linda! 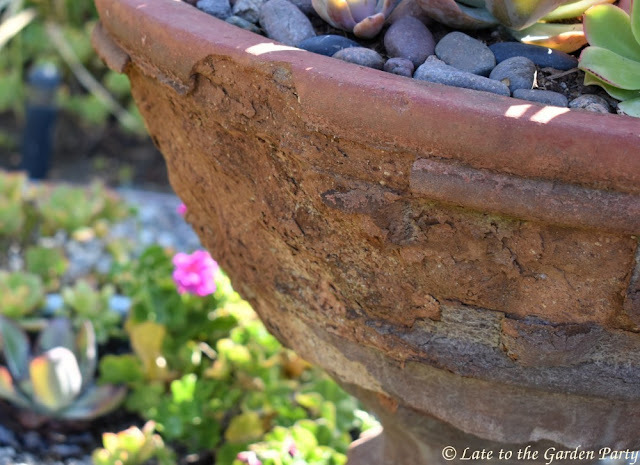 I have a couple of similar pots that are flaking and disintegrating too. I only paid a few bucks for them at a yard sale so I'm not too bothered, but it does mean I'll eventually have to find new ones for the big plants that are in them. I wouldn't dare plant in the ground at this time of year, but I am itching to get started. Nice work on the succulent pot! The Dermatobotrys was a impulse buy as I knew nothing about the plant when a picked it up - I just liked the foliage. It's proven to have all sorts of interesting characteristics. I like those Dr Suess type plants such as the one you have highlighted and the dark Aeonium that I have seen grown up like this. Bromeliads are so interesting to me. I can't imagine being able to grow them in the ground like this. I would want a slew of them if I could. Oh that Kalanchoe prolifera is fun! It's an interesting plant, Loreee, although for a "Jack in the Beanstalk" it seems slow growing to me! You have a whole bunch of very choice plants. They look great, too. 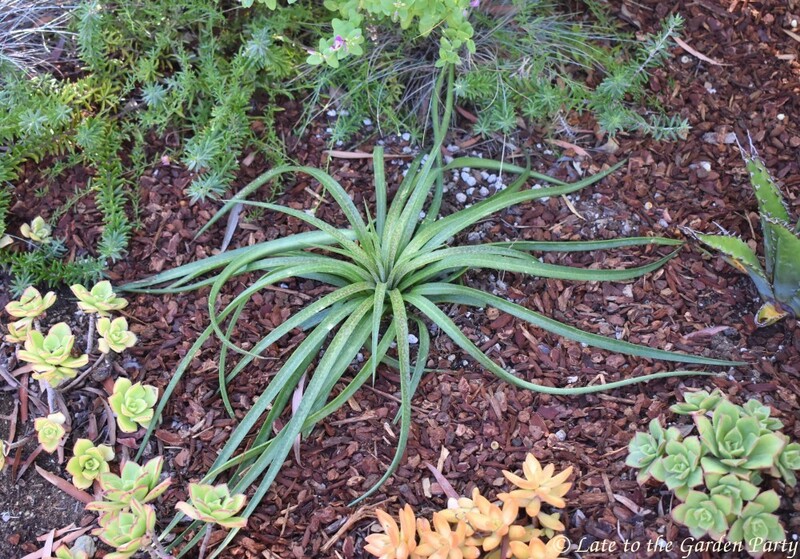 Your Agave ovatifolia there in the first photo though unmentioned is a beauty. 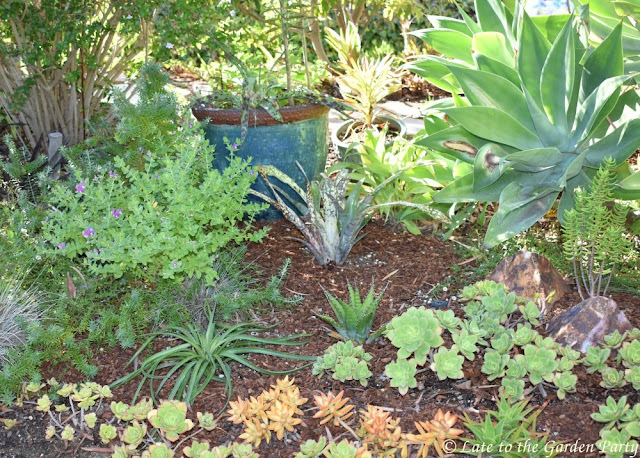 The Agave ovatifolia was one of the first plants I added in that area once I cleared it of the gravel and plastic weed barrier some previous owner had covered the area with. It's not 'Moby' size but it's getting there! What a collection, and so handsomely set out....I shouldn't wonder that you have been head hunted by Kew? My horticultural skills are far more limited than you give me credit for, Noelle! 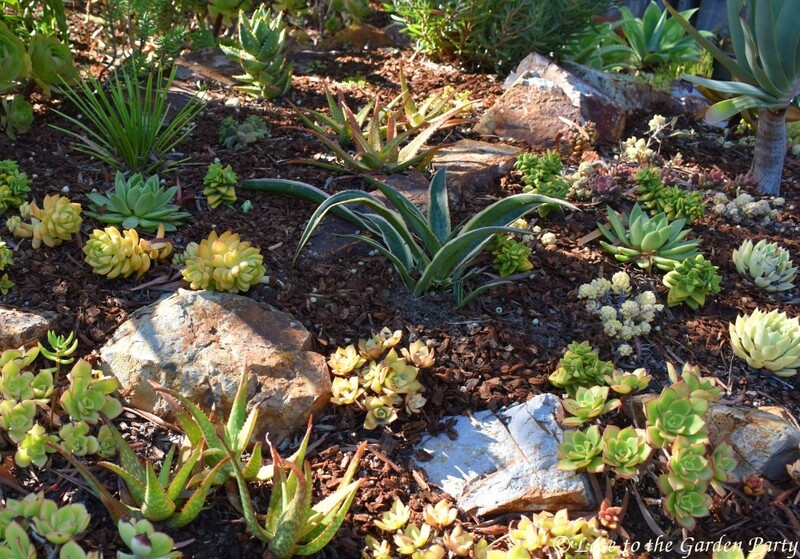 You have a significant collection of succulent plants Kris; they all work so well together too giving you colour, form and texture and the added bonus of some flowers too. My succulent collection has certainly grown since we moved here, Christina! Wednesday Vignette: Too much of a good thing?